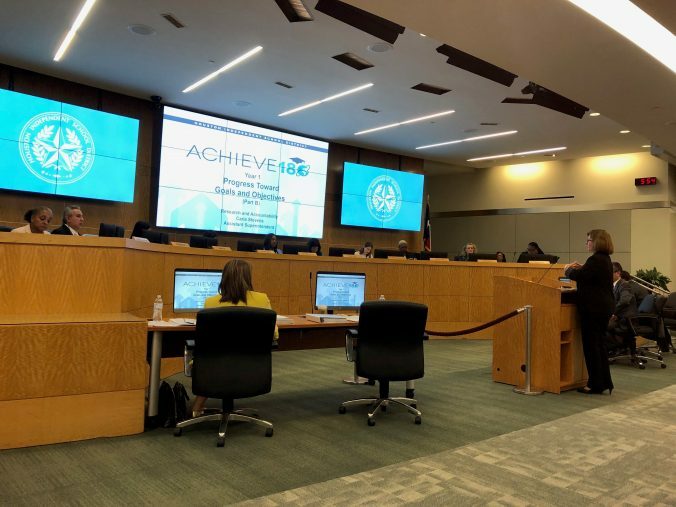 The HISD Board of Education received an update on Thursday from Assistant Superintendent of Research and Accountability Carla Stevens, who shared key achievements from a 250-plus page comprehensive report on the progress made within the Achieve 180 program for the 2017-2018 school year. With testing coming up in April, it’s time for Achieve 180 and HISD’s Research and Accountability to fully vet the program’s progress to further predict the trajectory on the future of the program. “It’s important to have these types of reports where we can have enough time to interpret the data, provide recommendations, and take a proactive approach in developing a plan for the 2019-2020 school year,” Interim Superintendent Grenita Lathan said. Though the program expects continued academic strides for the 2018-2019 school year, the detailed report identified areas of opportunity that will allow district leaders and campuses to plan targeted strategies on how they close academic achievement gaps and increase district-level support to equip campuses with highly effective teachers and leaders. “There were a few milestones for Achieve 180 campuses in which the program decreased failure rates, increased in the categories of effective and highly effective leaders and teachers at the campuses, and showed increases in literacy and mathematics that exceeded those shown by the district,” Stevens said. There was also a celebratory moment for the district’s career readiness efforts – three out of six Achieve 180 high school campuses’ students had a passing rate at or above 90 percent for CTE industry exams. Overall, the report showed the Achieve 180 program supported the district in meeting or exceeding the goals set by the Board in the following areas: reading and writing at or above grade level; graduates meeting Global Graduate standards; and students with below-satisfactory performance in reading or mathematics gaining at least one year of academic growth. In its second year of implementation, the comprehensive results shared during the board meeting demonstrate the district’s capabilities in continuing to ensure Achieve 180 remains on target in improving student outcomes for the district’s most underserved campuses. This entry was posted in News on March 22, 2019 by HISD Communications.